Frankfurt am Main, Germany, 2018-Nov-08 — /Travel PR News/ — The IntercityHotel Zurich Airport will become the brand’s first venture into Switzerland when building works are completed in 2020. Construction is now beginning on schedule, and a number of characteristic features are already emerging. As with all IntercityHotels, the USP will be easy accessibility. The IntercityHotel Zurich Airport is extremely conveniently positioned at Rümlang Station right next to the airport grounds themselves. Like all the brand’s new generation hotels, its interior design concept will bear the signature of the Italian architect Matteo Thun. 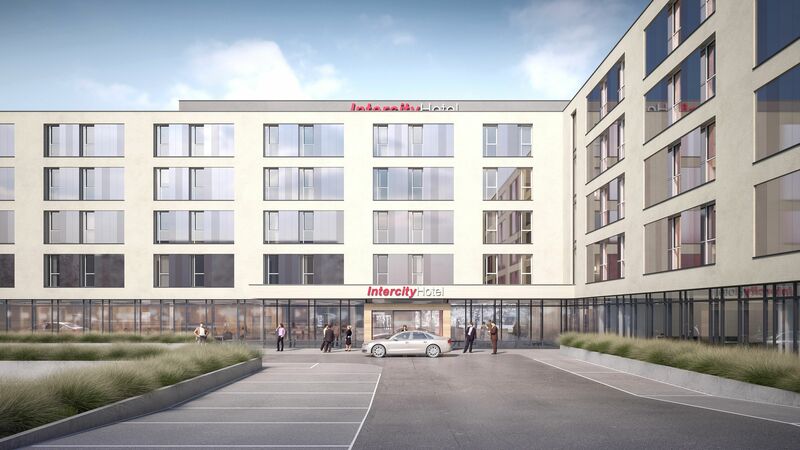 The new IntercityHotel Zurich Airport will have around 260 rooms and will also boast a restaurant and a bar. A conference area of 450 square metres will offer sufficient space for meetings and events. A spa and gym area will ensure that guests also enjoy plenty of opportunity to relax. 180 on-site parking spaces will be available. IntercityHotel has now moved to its fourth design generation, and the Italian architect Matteo Thun will be responsible for creating the hotel’s look and feel. State-of-the-art technology will also be in place in Zurich in the form of the IntercityHotel App. This ensures a thoroughly modern experience by allowing guests to check in, check out and open the door to their room via smart phone. Another of the brand’s long-standing trademark features is the FreeCityTicket scheme, which is included in the room price and permits free use of the local transport system. Guests in Zurich will also be able to enjoy this convenient and environmentally friendly way of travelling from A to B within the city. The IntercityHotel Zurich Airport’s location at Rümlang station not far from the A1 motorway offers fantastic transport links. Zurich International Airport can be accessed in only ten minutes, and the city centre is also just 15 minutes away. Zurich has around 400,000 inhabitants. It is the largest city in Switzerland and acts as the most important traffic hub in the country for rail and air travel. IntercityHotel is continuing its course of international expansion. Following the recent signing of an agreement for the IntercityHotel Riyadh Malaz in Saudi Arabia, the brand is now also planning to strengthen its presence in Europe still further. IntercityHotel is a Deutsche Hospitality brand which stands for modern upper mid-range urban hotels. IntercityHotels are located within easy walking distance of airports or railway stations. Guests also benefit from a “FreeCityTicket” scheme, which enables them to use local public transport free of charge. The IntercityHotels portfolio includes over 39 hotels in Germany, Austria, the Netherlands, Oman and China, and 20 further hotels are currently at the development stage. Deutsche Hospitality operates three further brands. Steigenberger Hotels and Resorts boasts 60 hotels housed in historic traditional buildings and lively city residences and also offers health and beauty oases set at the very heart of nature. MAXX by Steigenberger is a new and charismatic concept which places the focus on the essential in accordance with its motto “MAXXimize your stay”, whilst Jaz in the City branded hotels reflect metropolitan lifestyle and draw upon the local music and cultural scene. This entry was posted in Airports, Business, Hospitality, Hotels, Travel, Travelers and tagged Deutsche Hospitality, Gérard van Liempt, hotel, InterCityHotel, Matteo Thun, Switzerland, Thomas Willms, Zurich Airport. Bookmark the permalink.